LiveWeb Language Training – Studio MONDIALE, Sprachenschule in Darmstadt für Deutschkurse, Englischkurse & mehr! LiveWeb Language Training is flexible, internet-based language training within a virtual classroom. Therefore it’s not important where the course participants actually are, and whether all participants are present at the same time, in the same room. The language course can take place everywhere. MONDIALE LiveWeb language training takes place with a qualified trainer, not by means of educational software. You work with your teacher, hear and see each other in a virtual classroom setting. Language training, whenever you want. Save money and time, instead of travelling to lessons. Includes initial placement test, needs analysis and optional evaluation test. Tailored to the needs and (occupational) requirements of course participants. Whether abroad, on business trips, at home or at work, the language course can take place anywhere. 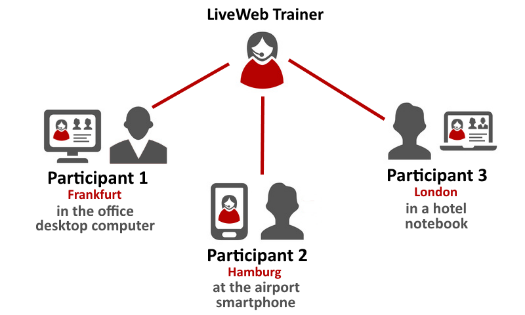 LiveWeb Language Training can be booked as individual one-to-one sessions or as group training and is therefore ideal for people, who work decentrally or travel a lot. MONDIALE LiveWeb Language Training is always provided live with a qualified trainer and is tailored to the needs and occupational requirements of course participants. The best way to learn a language is direct interaction. MONDIALE LiveWeb language training takes place with a qualified trainer, not by means of educational software. You work with your teacher, hear and see each other in a virtual classroom setting. Our consultants will provide you with the proper orientation and are available to answer your questions. Each LiveWeb language training is initiated by a placement test to determine the current language level of the student, both in written and spoken language, free of charge, and can be optionally evaluated at the end of the training. This offers you a valid profile of your actual level. We decide on individualized content together with you and thereby determine your target profile. Dates for MONDIALE LiveWeb Language Training can be booked at anytime and at short notice via the online calendar, subject to availability and the requirements of the participant. Of course we can offer you a free trial session so that you can get familiar with MONDIALE LiveWeb Language Training, and make your own impressions about our methods! What is LiveWeb language training? LiveWeb Language Training gives you the opportunity to conduct your language training alone or in a group with a teacher. It does not matter where you are. Where does LiveWeb language training take place? Since you learn via a web conference platform, select the place where you would like to learn best. In this way you are completely flexible and save the trip to a training location. You receive your desired training on site, just in time. 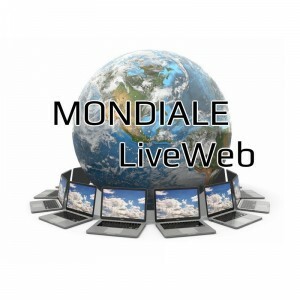 MONDIALE LiveWeb language training can be booked as individual or group training. The MONDIALE portal enables direct face-to-face lessons. You work with your teacher, hear and see each other. In addition, it is possible to work with a whiteboard, exchange learning materials and documents and visit websites together. The entire class can be recorded if necessary and is therefore comprehensible for missing participants. You do not need to install any software. Your Internet connection should be stable and have a good bandwidth. Your PC requires a webcam and a headset with microphone. 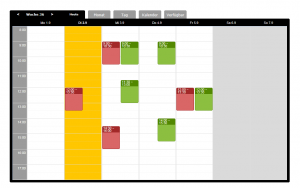 How can I make appointments for LiveWeb language training? You arrange your desired lessons directly and flexibly with us, according to your needs. How are my learning contents determined? You have access to the online requirements analysis and can define your learning requirements and wishes in detail. A free online placement test (written and oral) determines your entry level. What is the minimum number of LiveWeb training sessions I need to book? You do not have to book a minimum quantity with us. We offer you attractive unit packages, which include an appropriate discount. Please contact us in order to determine the number of lessons that will bring you to your goal. How much does LiveWeb language training cost? The price per lesson depends on the volume of bookings and the number of participants. Discounts are possible. Please contact us for an individual quote. Before booking a language course, you will of course have the opportunity to convince yourself of the quality of the LiveWeb language training by means of a free and non-binding trial lesson. A free trial lesson eliminates the need for a placement test and a needs analysis. The free trial lesson cannot be equated in content with a demand-oriented, targeted teaching unit, but serves mainly to familiarize you with the MONDIALE LiveWeb language training and to present the technical and content-related possibilities. To take a free trial lesson, please fill out the following form.